What Are Patients Saying About Dr Parenteau? “7 years ago all I saw was darkness – lights off, sheets over the window & the noise! My migraines were chipping away at my life & sanity. Then I started going to Dr. Parenteau. I truly believe he saved me. His therapy style, his proactive way of including exercise rehabilitation & view of health in general is top notch! Gone is the old stigma of chiropractors. He truly believes in his work and is passionate about it. Dr. Parenteau is such a great advocate for his patients & their ability to overcome – he gave me hope again & I will forever be grateful. days as a Scrum Half. “I always leave Dr. Parenteau’s office knowing more about my body, and how to keep it working better, than when I arrive. Dr. Parenteau not only takes excellent care of my chiropractic issues, he also works with me to improve and maintain healthy exercise habits that keep me moving and pain free. He quips he has done his job well if he doesn’t see me for months on end! However he sees me promptly if an “emergency” does arise. As an active, healthy senior this is service that I greatly appreciate. “Over the years I have been to a number of chiropractors and although most of them have been ok- only one has been truly exceptional, namely Dr Parenteau- he is a gifted healer. “I first started seeing Dr. Parenteau as part of my physio after a car accident in 2007 in which I sustained neck and shoulder injuries. His comprehensive approach to health was a huge factor in the improvement of my range of motion and strength. No more headaches, no pins and needles in my shoulder, it’s all good. When he gives you homework, make sure you do it, it makes a difference! 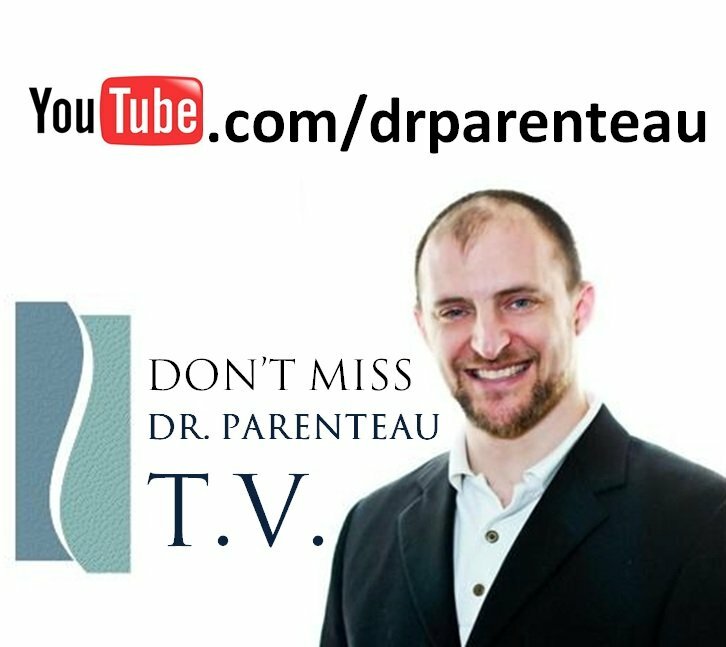 I have continued to use Dr. Parenteau ever since, whenever a minor issue comes up. Some people worry that using a chiropractor can turn you into a chronic sufferer, but it’s just the opposite: after a few treatments, the issue resolves, and you are better than ever. “I’ve been to a few chiropractors in Victoria after having suffered several lower back injuries from overexerting myself in badminton and I was pretty much convinced that they’re all quacks. A crack here and there in a very expensive “chiropractic chair”, all in less than 10 minutes and you’re sent out the door to pay your customary amount. I’ve worked out that these chiropractors pretty much make a fine $30-$40 every 15 minutes or so, with the way they try to churn patients out the door like in a factory line. Until Dr. P.
I had the misfortune of being in a car accident in late February 2010 with a somewhat debilitating neck injury and my GP suggested going to see a chiropractor in tandem with a physiotherapist. One of our friends suggested Victoria Exercise and Rehabilitation Centre, where Dr. P is housed. He completely proved me wrong and proceeded to be the most amiable, knowledgeable and effective chiropractor ever. The guy explained the injury, treatments available, billing and post-care stuff so well that you will feel like he pretty much anticipated and answered all your questions. He does a very thorough job from check up down to your last treatment which results in a very effective and continual healing process. The 3-4 months worth of treatments with Dr. P. gave me a solid foundation to build on and I’m pretty much back to full mobility now thanks to him and the physio staff there. My progression was very much in line with the expected time of recovery for my sort of injury (about 12 months) but I’d say I was feeling back at 100% by the 7 month. Bonus is, he’s also very up-to-date and modern; you can find him on Facebook and Youtube I believe, in addition to the monthly or so newsletters he sends out to his patients. The key thing to remember is that chiropractors are not miracle workers. You actually have to do your part too. If you constantly go to your chiropractor, GP or whatever and whine about how your back kills you but you over eat and don’t ever really work on your core or bother exercising, they can’t cure you. The important thing is to respect your body’s ability to heal but at the same time, push yourself too because a can-do mental attitude goes hand in hand with physical healing.